The Santorini View is located in Firostefani, just 1 km from Fira. It includes a sun terrace with panoramic views of the caldera and the Aegean Sea and studios with air conditioning and a kitchenette. Please inform Santorini View Firostefani Caldera in advance of your expected arrival time. For this, you can use the special requests section when making the reservation or contact the accommodation directly. The contact details appear on the booking confirmation. 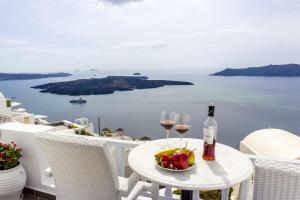 The property offers a pick-up service from the airport or the port of Santorini at an additional cost. If you wish to use this service, you must contact the Santorini View with at least 1 days in advance. This studio has views of the volcano and the Aegean Sea, air conditioning, a kitchenette, an LCD TV and a private bathroom with a hairdryer. Studio with a large double bed, views of the volcano and the Aegean Sea, air conditioning, a kitchenette, an LCD TV and a private bathroom with a hairdryer. This studio has a flat-screen TV, air conditioning and electric kettle. Attention: this type of room, due to its low ceiling, is not recommended for tall guests. This studio has an electric kettle, air conditioning and tile / marble floor. This accommodation is on the 2 floor, it is modern in style and offers views of the volcano and the caldera from its balcony. This studio is located on the ground floor and offers views of the caldera and the volcano. It has a king-size bed and a small seating area.